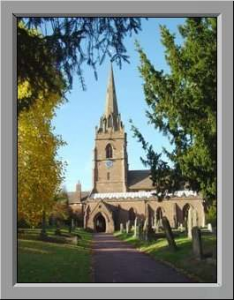 This web site is about the bells and the bellringers of St. Chad’s Church, Pattingham. We hope that it will be of interest to bellringers and to casual visitors. Pattingham is in Staffordshire, close to the border with Shropshire. The church has eight bells which are rung regularly by the local band of ringers. There will be no practice on Easter Monday (22nd April 2019). If you would like to find out about ringing at Pattingham look at the Times of Ringing and Calendar page. If you would like to know what is involved in ringing look at the Ringing as a Hobby page.
. If you prefer you could just turn up on a Monday evening and introduce yourself to us. See the the Times of Ringing and Calendar page for times and access arrangements.